Here are some of the reviews for The Book of Mirrors, by various magazines, popular blogs and Pagan sites. You may also wish to read a selection of personal feedback, sent to Luthaneal by his readership. Review: The Book of Mirrors There are many, many books on the market aimed at those wanting to learn about Wicca; none to date have been quite like The Book of Mirrors. Most of the other offerings are written by experienced Wiccan teachers and are intended as training manuals, explaining the basics of what Wiccans believe and providing a simplified introduction to the rituals Wiccans perform. 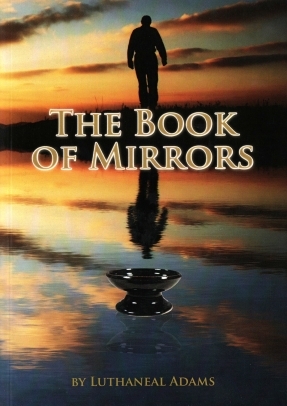 The Book of Mirrors is published by Capall Bann and the RRP is £11.95. ‘The Book of Mirrors’ is quite a unique book… actually it’s a very unique book, the likes of which I’ve never read before. The market for Wiccan books is huge, as is the sheer number of titles out there, so for Luthaneal Adams to pull out this absolute gem as his début is astounding. My main concern when reading the above text on the back cover of a book would be that I was about to invest in reading page after page of dramatic emotional self exploration, which although interesting would offer little in the way of practical advice to anyone. However nothing could be further from the truth. What ‘The Book of Mirrors’ actually does is present the road to initiation in a very honest, relatable way. This book is not preachy on any level, in fact it devotes as much time to the doubts, reservations and disappointments of the author, as it does the rewards and spiritual benefits. In the interests of giving a balanced review I always try and give some criticism of books, but in this case the only one I can honestly give is that it occasionally makes the reader feel slightly guilty. The type of guilt you feel when encroaching on someone’s privacy, looking at them a little too intensely, or reading their diary. In reality, this is something that the author should receive absolute praise for. ‘The Book of Mirrors’ is written entirely without ego, it is honest and it wholly endears the reader to the author. I honestly can’t see a way in which 'The Book of Mirrors', won’t become essential reading for every would-be initiate and coven leader. If you are interested in Wicca, read this book. If you are part of a coven, read this book. If you have Wiccan friends/family, read this book. Luthaneal Adams has produced a different take on the 'modern Wicca handbook', in that he focuses entirely on his personal experience of asking for and being accepted for training with a coven. He makes no bones about this being a universal guide. This is his personal journey and all the better for it. He has to contend with long journeys on public transport to reach his new covenstead, 'homework', in which he explores concepts such as the eightfold path, why we do rituals and what makes an effective ritual and the effect all this has on his personal relationships. The latter part of the book is interesting too, in that Adams showed the manuscript to his new coven for approval before publishing and he includes some valid points from them about how the view of a non-initiate must always be different from those already in the coven. [The Book of Mirrors] is a very personal account of [the author's] developing understanding of the mysteries as each part of the journey [along the path of initiation and coven work], revealed new ideas or just a different perspective on old ideas. As with everything in Wicca, these experiences are inextricably entwined with his coven members and close Craft kin; and of course life itself presents challenges, both within and without the coven, and these too play a part in the journey. Luthaneal has described his rite of passage in a style that is both personal and revealing. He writes about conversations, books he has read, techniques he has practiced, and rituals he has experienced. He has been honest about his preconceptions and where these have been challenged, he has also been candid about how and why he changed his mind --- or not. It is a fascinating first-hand account of the journey towards and beyond Wiccan initiation. I would recommend this book to experienced Wiccans for the insight into the mind of someone walking the path, and to those who wonder whether Wicca might be their own spiritual pathway. When Luthaneal began this journal of personal reflections he wasn’t initiated, nor did he ever imagine that his notes would ever become the basis of this book. In his introduction he writes “This book is a guided tour of my journey with the Wicca and the lessons that it brings me.” And so he begins his journey. Set in England in the last part of the 20th century we catch a glimpse of the social structure and milieu of a young man searching for a spiritual path. He shares his doubts and moments of joy… and also some of the rituals such as ‘Casting a Circle’ he practiced. In the section called Spells he describes a number of workings he did. His journey continues and he makes acquaintance with a couple who have their own coven. And so begins his Wicca journey in earnest and making copious notes. Luthaneal describes his own feelings about Wicca practice and asks pertinent questions such as “What ever happened to the Eight-fold Path?” and other equally thought-provoking questions. He also shares with us the moments of doubt, of the moments when one wonders if it is really worth the effort? He discusses too the academic studies versus practitioners’ experiences. How does one study an oral tradition? What is the value of archaelogical finds? All those often quirky questions such as “What is/was the Old Religion?” Is much of it pure fantasy and make-believe? And so the journey continues. Subjects such as Ritual & Magic, various ‘points of contention’, such as the 3-fold Return and working Skyclad, are all discussed. Does he get initiated in the end? Read the book and find out! This is a valuable book for all of those who seek the Wiccan Path. Luthaneal shares with his reader many thoughts… thoughts which probably cross many seekers. And whether you decide to follow in Luthaneal’s footsteps or just enjoy the ride it makes an interesting read. I’m proud to review a book written by a young Wiccan who has attended some of our moots! Luth is a great guy that is always welcome and a credit to this generation of young Pagans and witches. His book was written over the course of just over a year, the traditional time during which someone is trained and inducted into a Wiccan coven in what is known as ‘British Traditional Wicca’, that is, the Gardnerian and Alexandrian initiatory traditions. The book is a collection of diary-like chapters recounting his meetings with the prospective coven, some of their experiences and the subjects of their discussions and crucially, the intellectual and emotional journey that accompanies this process of discovery and making the decision whether or not Wicca was the right path for him and whether to ask for initiation. The book is not some kind of exposé and obviously is always respectful not to reveal any sensitive or oathbound material (the coven in the book had a chance to read drafts of it and feedback before it was published) but it is a valuable resource when it come to what to expect if seeking to join a Gardnerian or Alexandrian coven. The book is a personal journey and the fact that chapters were written fresh out of each meeting, discussion or experience is very useful as a decision such as this is very much based on instinct, emotional response, a sense of trust and generally ‘whether it feels right’. Joining a coven is not just about joining that tradition, it is about joining a particular group of people. The analogy I always use is that it takes more to make a band work than just having a group of very good musicians, it is also about whether they gel together and enjoy each other’s company and ways of working. The author’s sentiments about how welcoming the group is and how their discussions are conducted seems to be a big part of what make him feel it is the right group for him. There are a couple of subjects concerning Wicca that the author covers very well: there is a detailed exploration of ‘the Threefold Law’, a theological concept that he seeks to make sense of since it is not something he instinctively agrees with (personally I’m with him there). He does a lot of research about which books it appears in and whether or not it is actually an idea that was part of Gerald Gardner’s original teachings. Not only does he trace its history incredibly thoroughly, but he also explores possible interpretations of it, even coming up with one that I can get on board with! The other subject he covers in detail that I found useful is the idea of working ‘skyclad’ (without clothes! ), as a large number of Wiccan covens do. He covers inhibitions that people might have (vanity, cold, dubious partners) and also the reasons that people do work skyclad and the benefits that people experience when they shed their outer selves. What I will say against the book is that it is a first edition publication by Capall Bann publishing – a company great at finding new Pagan authors but not so great at proof-reading: the book comes with an insert correcting various footnotes that appear on the wrong pages, and the book is littered with small but bizarrely inconsistent spelling and grammar errors that are a little clangy for an English graduate and grammar pedant such as myself – but I have high hopes that such glitches can be resolved when it hopefully goes for a second print! Basically the author comes at Wicca as someone well-informed about its public perception but also well-informed about the misinformation and the general bad resources out there (that exist alongside the good ones). He talks about magic, deity, nature worship, the elements, the wheel of the year and other crucial practices that make up Wicca and how he feels about them, finding out with great relief that a variety of opinions are held and accepted within the tradition. The only real way to get an idea of modern Wicca is to speak to modern Wiccans, which is exactly what the book is all about. Luth is now part of the coven in the book and is working on a new Paganism introductory book which I look forward to.